Thirty points by early Feb is a fantastic achievement and although you can now get 28/1 for Swansea being relegated, the job’s not fully done yet. Luckily in Rodgers I think we have someone who deals with both victory and defeat in a measured manner and will continue to get the best out of the squad. With an unchanged team from the Chelsea game, Sigurdsson’s arrival has provided the missing piece of the jigsaw and I’d argue that the starting line-up picks itself. That’s not a criticism on the likes of Routledge, Agustien, Gower, Monk and Lita who have all at various points provided important contributions, but the current balance feels spot on. In the three league games he’s started so far, Sigurdsson has had the most shots of any Swansea player (12) with the next highest being Danny Graham with 7, despite West Brom being the first league game he’s completed. 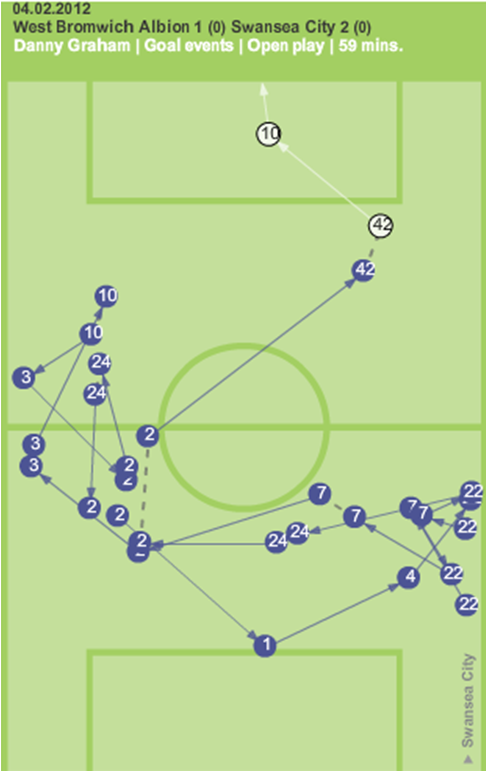 This allows Joe Allen to play deeper which adds the benefit of Allen’s tackling ability which is something that may have been previously overlooked given his other talents, although this was picked up by Zonal Marking (and others) with regards to the second half of the Arsenal game after the introduction of Sigurdsson. Overall, Allen made 8 of Swansea’s 17 successful ground tackles with the next highest being Williams/Caulker with 2 each. Allen made 8 Successful tackles, of which 7 were in the first half. As mentioned in last weeks analysis of the Chelsea game, it’s not often someone is more involved than Angel Rangel and he was back in his usual place at top of the list of number of touches per player. 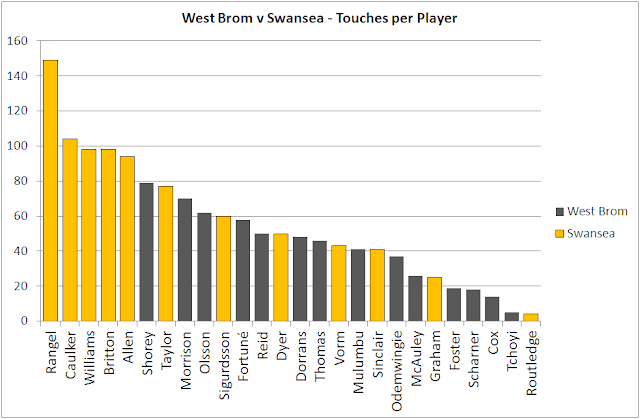 Rangel had 149 touches almost double that of the highest West Brom player (Shorey with 79) and around 50% higher than that of Williams/Caulker. There was definitely an element of Swansea riding their luck a bit with Williams’ handball, Odemwingie’s miss and Fortune’s late shot just being kept out by Vorm but when you score a goal as good as Swansea’s second you could argue that you deserve that luck. Graham’s goal along with Lita’s against Blackburn have arguably been two of the best team goals all season. Norwich on Saturday offers a fascinating match up with a team that might not have had pundits drooling in the same way as Swansea but have also done a great job (and have two more points as it stands) and took us apart at Carrow Road earlier in the season.